Cutting is a collection of processes wherein material is brought to a specified geometry by removing excess material using various kinds of tooling to leave a finished part that meets specifications. The net result of cutting is two products, the waste or excess material, and the finished part. In cutting metals the waste is chips or swarf and excess metal. Drilling a hole in a metal part is the most common example of a chip producing process. Using an oxy-fuel cutting torch to separate a plate of steel into smaller pieces is an example of burning. Turning is a metal cutting process for producing a cylindrical surface with a single point tool. The workpiece is rotated on a spindle and the cutting tool is fed into it radially, axially or both. Producing surfaces perpendicular to the workpiece axis is called facing. Producing surfaces using both radial and axial feeds is called profiling. Chamfering: Cutting an angle on the corner of a cylinder. Parting: The tool is fed radially into the workpiece to cut off the end of a part. Threading: A tool is fed along and across the outside or inside surface of rotating parts to produce external or internal threads. Boring: A single-point tool is fed linearly and parallel to the axis of rotation. Drilling: Feeding the drill into the workpiece axially. Knurling: Produces a regular cross-hatched pattern in work surfaces intended to be gripped by hand. uses an abrasive process to remove material from the workpiece. A grinding machine is a machine tool used for producing very fine finishes, making very light cuts, or high precision forms using an abrasive wheel as the cutting device. This wheel can be made up of various sizes and types of stones, diamonds or organic materials. The simplest grinder is a bench grinder or a hand-held angle grinder, for deburring parts or cutting metal with a zip-disc. Grinders have increased in size and complexity with advances in time and technology. From the old days of a manual toolroom grinder sharpening endmills for a production shop, to today grinding processes vary greatly. Grinders need to be very rigid machines to produce the required finish.The common rule is the machines used to produce scales be 10 times more accurate than the machines the parts are produced for. is the complex shaping of metal or other materials by removing material to form the final shape. 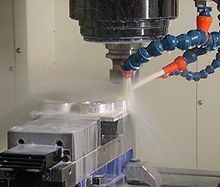 It is generally done on a milling machine, a power-driven machine that in its basic form consists of a milling cutter that rotates about the spindle axis (like a drill), and a worktable that can move in multiple directions (usually two dimensions [x and y axis] relative to the workpiece). The spindle usually moves in the z axis. It is possible to raise the table (where the workpiece rests). Milling machines may be operated manually, and can perform a vast number of complex operations, such as slot cutting, planing, drilling and threading, rabbeting, routing etc. Two common types of mills are the horizontal mill and vertical mill. Materials that can be milled range from aluminum to stainless steel and almost everything in between. There are many threading processes including: cutting threads with a tap or die, thread milling, single-point thread cutting. 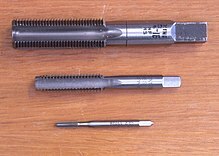 A tap is used to cut a female thread on the inside surface of a pre-drilled hole, while a die cuts a male thread on a preformed cylindrical rod. Phillips Machine & Stamping Corp. Content copyright . Phillips Machine & Stamping Corp.. All rights reserved. plastic or metal assembly project?